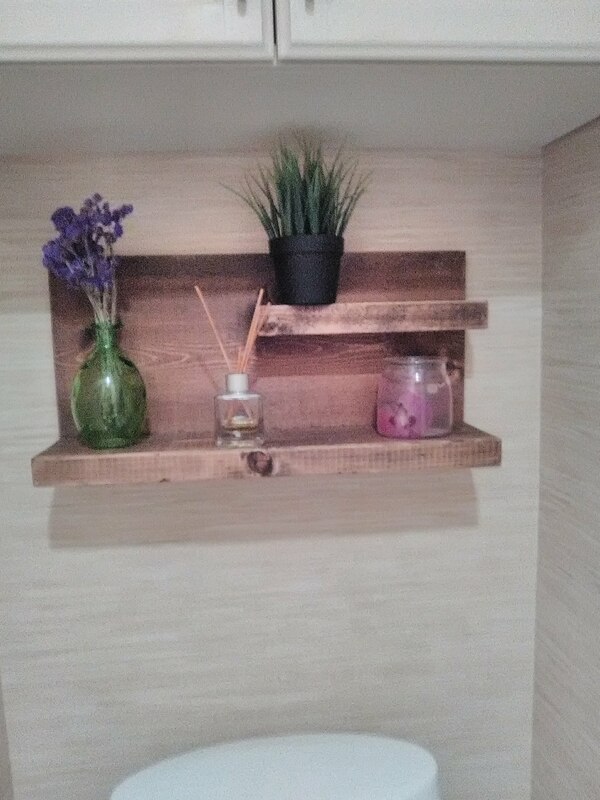 This West University mother of young children went to YouTube for some primers on how to hang wallpaper, and then, along with hubby, spent a 3-day weekend tackling the powder room redo project. They didn’t do a horrible job (first three photos), but there were some things that must not have been covered on YouTube. 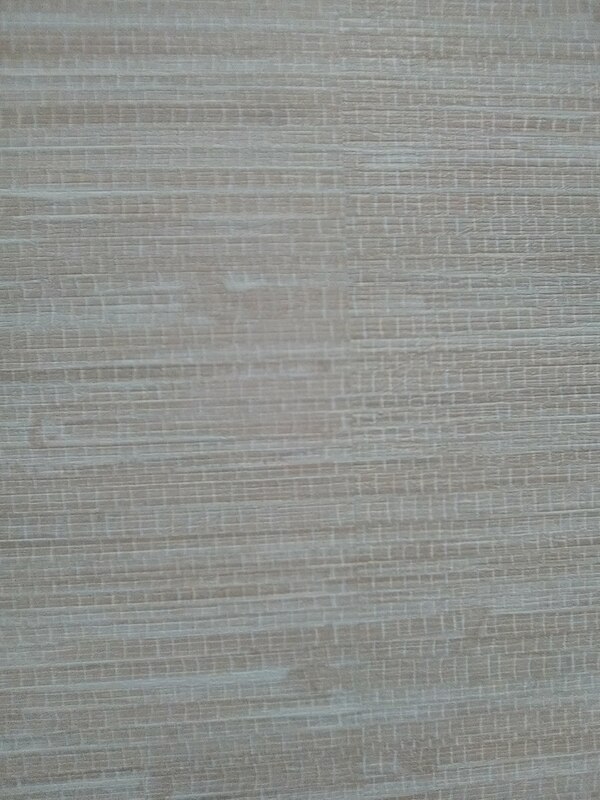 First, and probably most important, the walls should have been primed with a product designed for wallpaper. Second, seams should be butted, not overlapped. 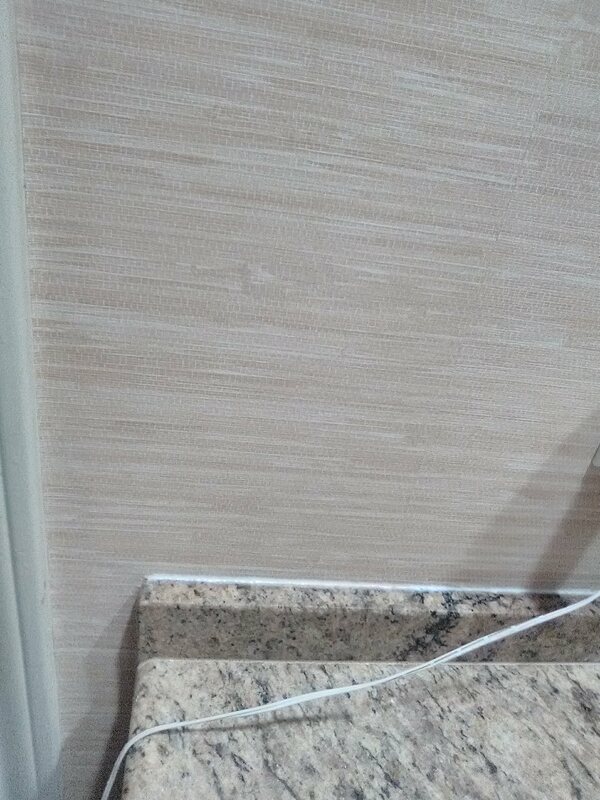 Third, wallpaper should not be wrapped around the door moldings, but trimmed at the base. 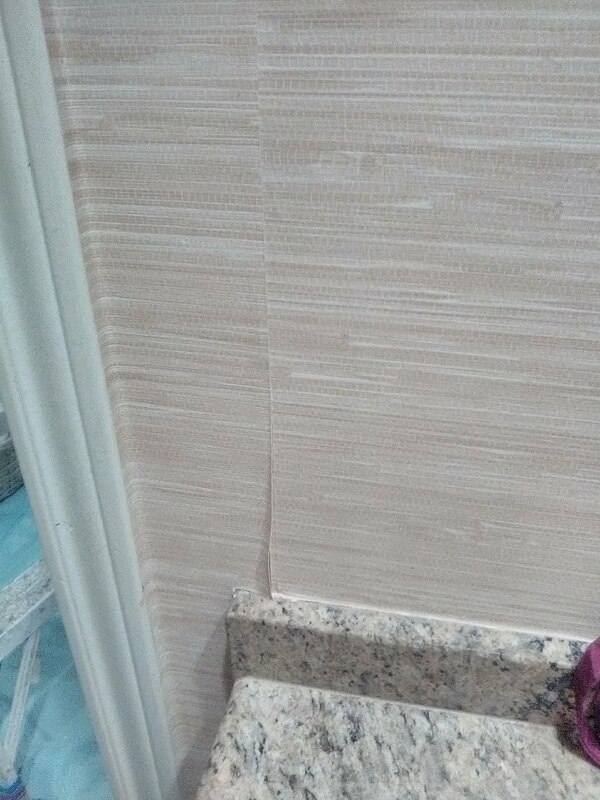 Fourth, I’m not sure what’s going on with the cuts at the baseboard. 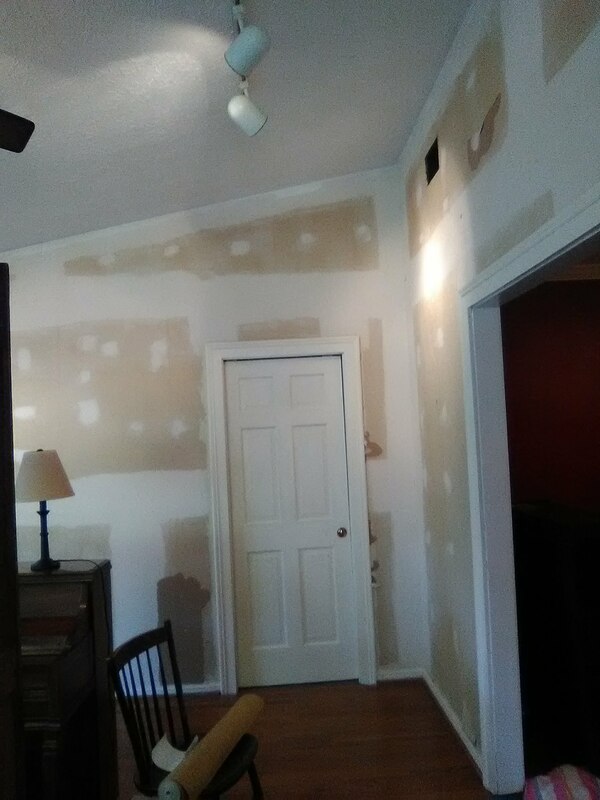 I think the room had seen a number of redecorating efforts, and that the baseboards took a bit of a beating in the process, leaving a surface that wasn’t smooth and wasn’t willing to hold on to wallpaper. 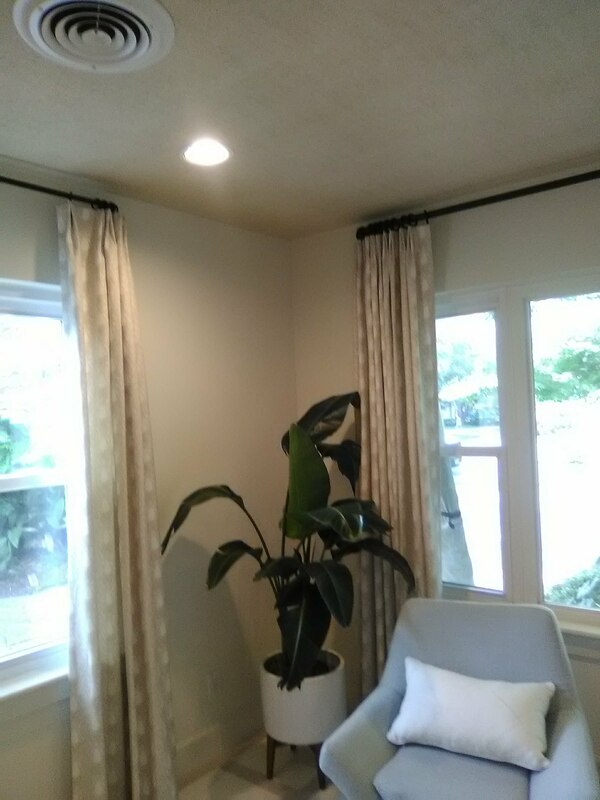 I stripped off their wallpaper, patched bad spots, sanded the walls, then primed with Gardz, a penetrating sealing primer that bonds together porous surfaces and that is also a good base to hold wallpaper. 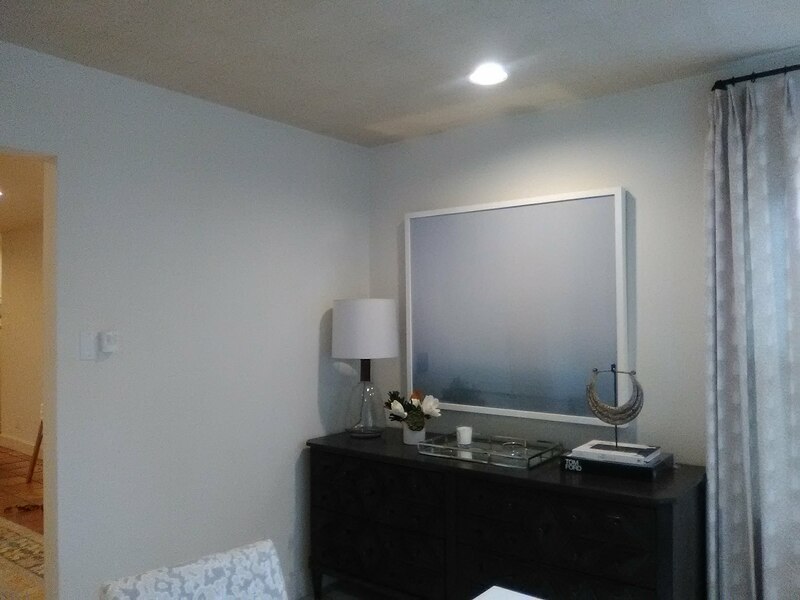 The rest of the photos are of the room after I hung the new paper. 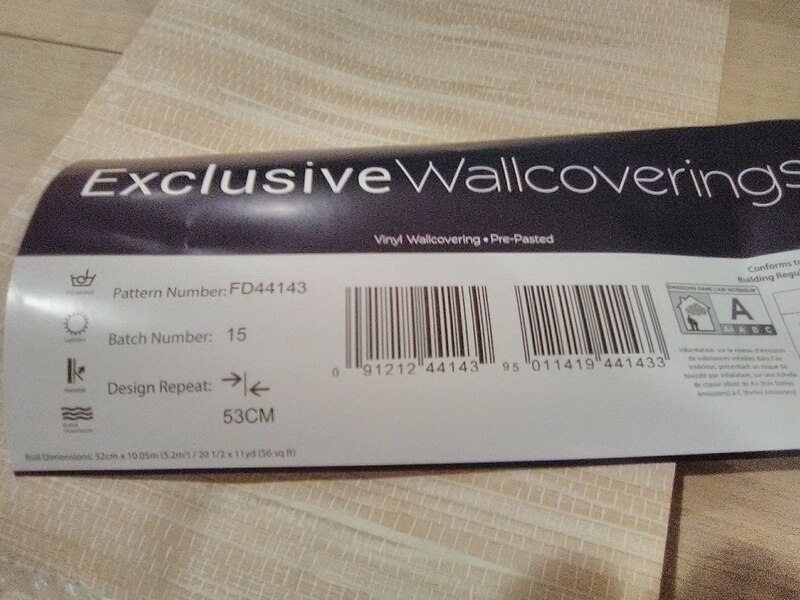 This product is a pre-pasted, paper-backed, solid vinyl material. It happens to be one of my least favorite kinds of wallpaper. 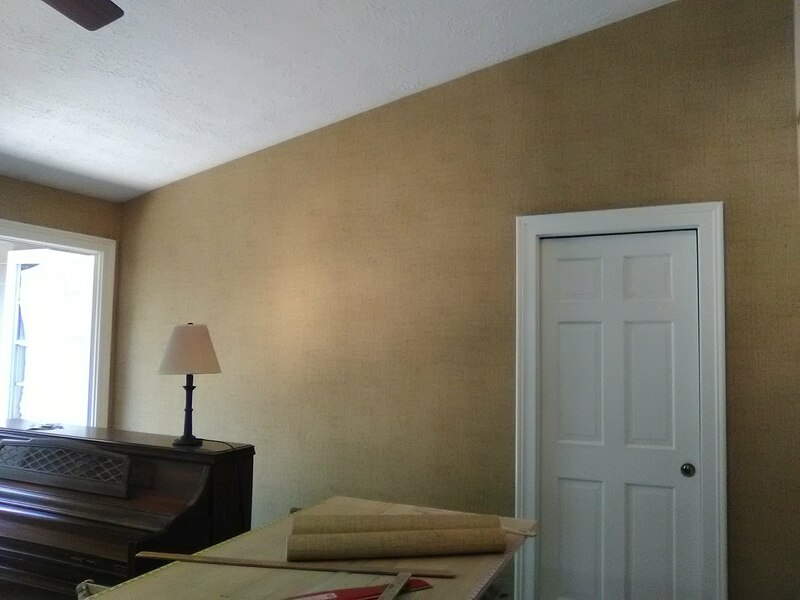 The homeowner chose it because she has young children and the vinyl is reputed to be more water-resistant and durable than other types of wallpaper. If she had consulted with me before she bought her paper, I would have steered her in another direction. 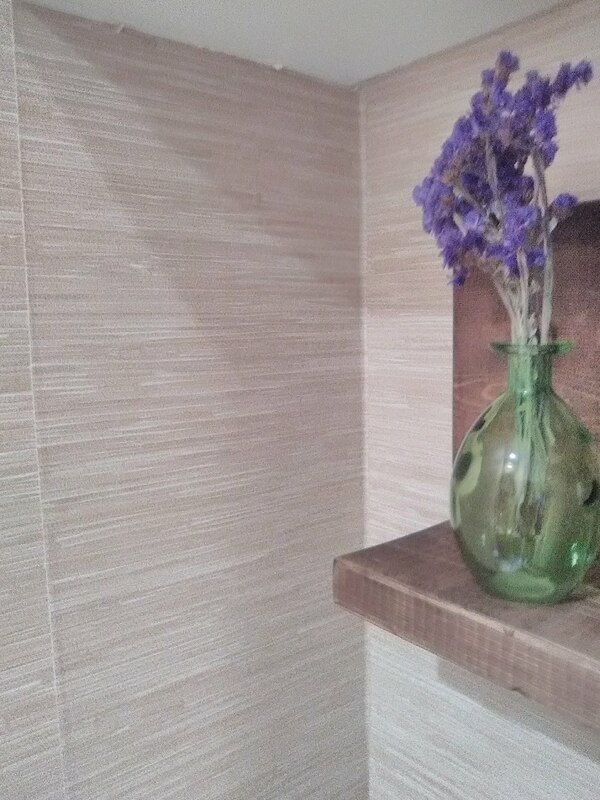 It’s true that the vinyl surface is resistant to water, and it’s more resistant to stains than a paper-wallpaper. But that doesn’t make the product wonderful. The main problem is the paper backing. This stuff is not horrible, but it does have a reputation for curling a tad at the seams (do a search on my blog for previous posts). Humidity (such as in a bathroom with showering) can cause increased curling at the seams. 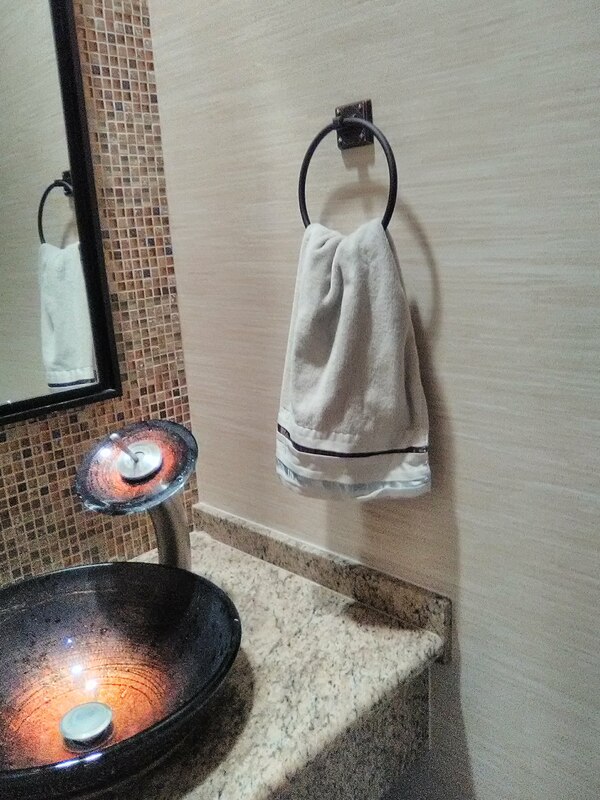 Any water that falls on a cut edge of the paper (along backsplashes, seams under hand towels, etc.) can wick into the paper backing and cause it to expand, which will cause the seams to curl. 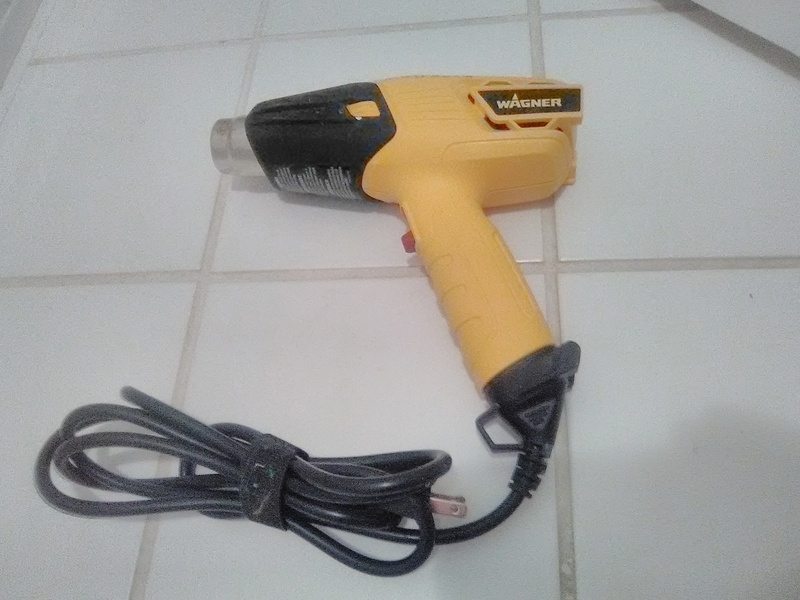 To reduce the potential for seam curling, I used a special pasting process (rather than following the manufacturer’s instructions). 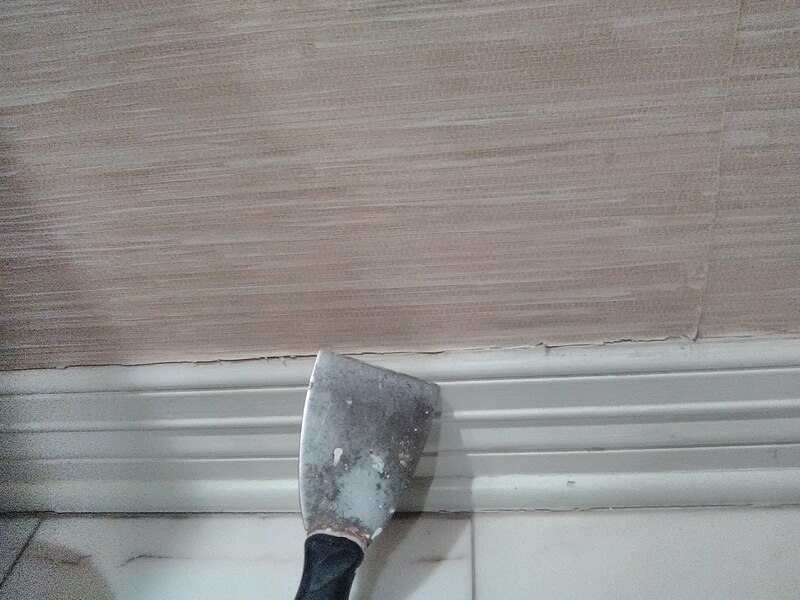 And I ran a bead of caulk along the top of the backsplash (see 4th photo – the caulk will be clear when it’s dry) to prevent splashed water from wicking up under the wallpaper. My trim cuts along the baseboard looked better than the homeowners’, but I still felt the baseboard was compromised somehow and that wallpaper did not have a good surface to grip ahold of. So I ran a bead of caulk along the top of the baseboards, too. 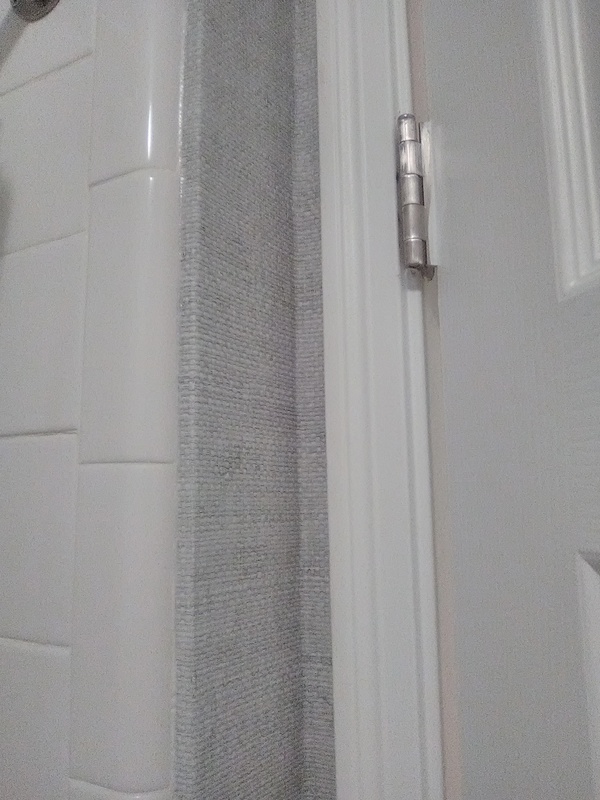 Next time around, when a mom has concerns about her kids touching or splashing the wallpaper, I would suggest she consider one of the newish non-woven products. 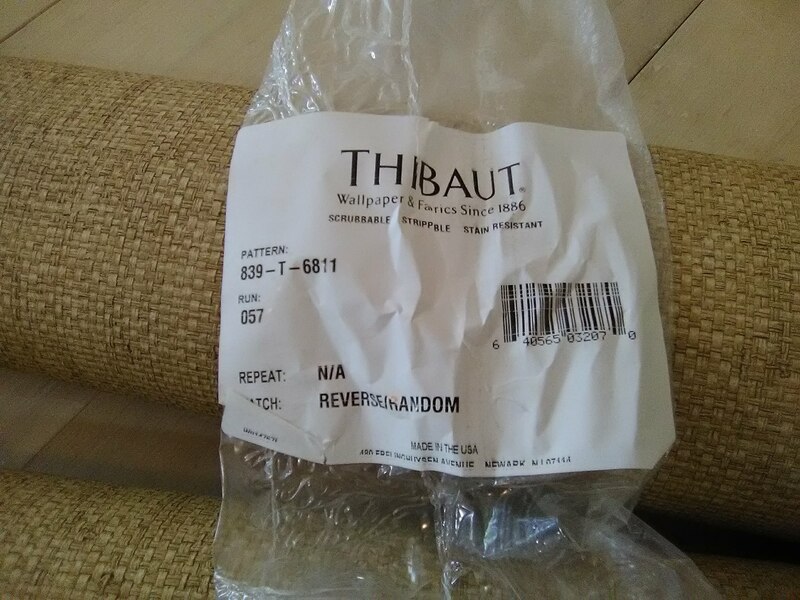 Or, better yet, a scrim-backed (woven fabric-backed) solid vinyl product, such as something from the Thibaut brand Texture Resource line, particularly Volume 4. Everything in that book is beautifully textured and realistic, and virtually indestructible. Do a search here to see my previous posts.